Naamah and Lamech are both names associated with the rulers among Abraham's people. Naamah is a royal name as attested by the name's connection with the Davidic Dynasty. David's grandson's mother was named Naamah (II Chron. 12:13). This is also the name of a region of Judah (Joshua 15:41). Lamech is a variant of la-melech which appears on several thousand Egyptian seals. It means "of the King" or "for the King." Lamech ruled after Methuselah and is assigned another perfect number in the Masoretic text. He is said to have lived 777 years. However, while the Scriptures agree on Methuselah’s 969 years, they disagree on the numbers assigned to Lamech. The Septuagint (Greek Old Testament) assigns Lamech 753 years, whereas the Samaritan Pentateuch assigns him 653 years. The Masoretic text provides the number that fits the biblical pattern. St. John Chrysostom noted the assignment of 7 to Cain, 77 to Lamech the Elder, and 777 to Lamech the Younger and believed that the number 7 in these cases speaks of God’s mercy shown to sinners. It is likely that seven represents the seven visible planets and is linked to astrological concepts of ancient Egypt. We may never know exactly what these number sets signify, but the association of such auspicious numbers – 6, 7 and 9 – with Methuselah and his son Lamech indicate their greatness. Some view Lamech the Younger, named in Genesis 5, as the same Lamech named in Genesis 4 who bragged about killing a man. This is a mistake. Lamech the Elder is not presented as a righteous man, but as a braggart who set himself up as an equal to God. Lamech the Younger, on the other hand, is the son of a righteous father and the father of Noah who found favor with God. Why should there be such discrepancy in the number of years assigned to Lamech the Younger? Possibly the Septuagint didn’t recognize that there are two different persons named Lamech. 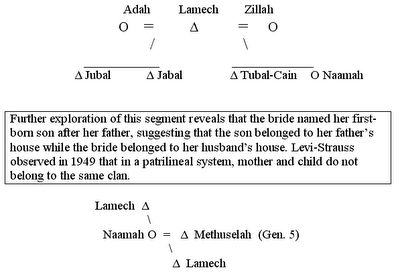 Or the discrepancy might indicate dispute over Lamech’s character among the different recensions. Or it simply may be that the Septuagint and the Samaritan texts reflect lack of understanding of the kinship pattern of Abraham’s ruling ancestors. I believe the discrepancy in numbers assigned to Lamech the Younger indicates lack of understanding of the kinship pattern. In this patrilineal system involving royalty and ascent to the throne, mother and first-born son do not belong to the same clan. The bride belongs to her husband’s clan while her son, if given her father’s throne name, belongs to the bride’s clan. The brilliant anthropologist, Lévi-Strauss recognized this in 1949, but his research was largely ignored by biblical scholars. So it is that Naamah belonged to Methuselah’s clan, of the lne of Seth, while their first-born son belonged to the clan of his maternal grandfather, of the line of Kain. 1. The number seven has special significance as related to the first-born son’s marriage and his reception of a kingdom. In Jewish weddings the seven marriage blessings (Sheva Brachot) are recited under the huppah and the wedding feast lasts seven days. The assignment of 777 to Lamech the Younger symbolizes the son's marriage and ascension to the throne of his father. 2. Numbers were associated with totems such as the Lion, the Falcon, the Baboon, etc. The four sons of Horus are an example. Imsety is shown with a man’s head. Tuamutf is shown with a jackel’s head. Kabhsenuf is shown with a baboon’s head, and Hapi is shown with a falcon or hawk’s head. Mummification involved removing the body's organs which were placed in four jars adorned with the heads of these four sons. These four stood as guardians over the organs until such a time as the Ka and the Ba could be united, thus avoiding the second death (of which John speaks). 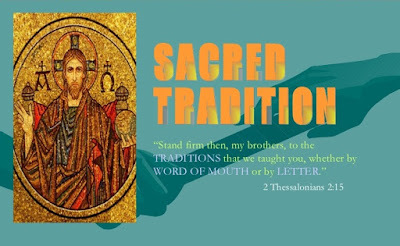 Likewise, the Four Gospels have totems: Eagle (Matthew), Bull (Mark), Lion (Luke) and Man (John) and the Gospel writers are indeed guardians of Holy Tradition concerning the Son of God. 3. Lamech’s wives were named Adah (dawn) and t-Zillah (dusk), suggesting that Lamech the Elder placed his 2 wives on an east-west axis. All the other rulers listed in Genesis 4 and 5 likely had 2 wives also but it appears that they placed them on a north-south axis, as did Abraham. Sarah lived in Hebron and Keturah lived in Beersheba, to the south. By placing his wives on an east-west axis, Lamech the Elder claimed a territory corresponding to that of the Creator, whose emblem the Sun, makes a daily journey over the Earth, traveling from east to west. It is interesting to note that Mohammed, a descendent of Abraham by Keturah, placed his 2 wives’ apartments on the east and west sides of his mosque in Medina. Doubtless, this lent credibilty to his claim to be The Prophet of Allah.